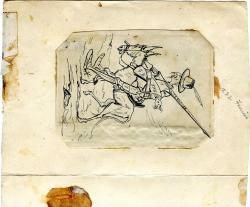 Original ink caricature by Furniss of Haggard in the character of Don Quixote. Without date [but circa 1887?] or place. On paper roughly four and a quarter inches by three and a quarter wide, with corners snipped to make an irregular octohedron. Good clear illustration on ruckled, aged paper. Tipped onto a larger piece of aged glue-stained paper. 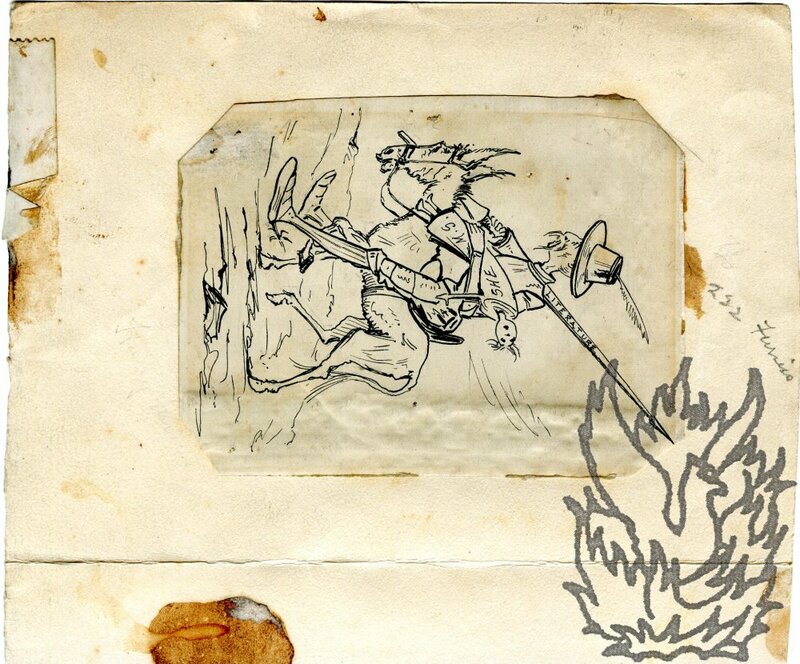 An amusing caricature showing Haggard astride Rozinante, in a full suit of armour, with an inkpot and quill pen as hat, holding a lance inscribed 'LITERATURE' in one hand, and a baby wrapped in a large roll of paper inscribed 'SHE M.S.' in the other. Unsigned, and attributed to Furniss in pencil on mount. Docketed (in Furniss's hand?) on reverse 'The Rider Haggard - "Fader ob She."' Haggard's 'She' was first serialized in the "Graphic" from October 1886 to January 1887. Presumably the original of an image used in a magazine, but no version of this drawing appears to be held by the National Portrait Gallery.